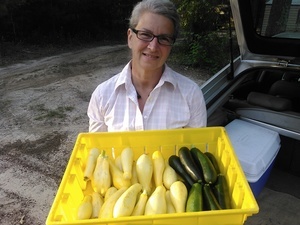 Gretchen took this yellow squash and zucchini to Wiregrass Farmers Market in Tifton, GA this morning, along with fresh-plowed potatoes, rosemary, and of course heirloom corn grits. That’s 9AM to noon, behind the Country Store at the Georgia Museum of Agriculture (Agrirama), 1392 Whiddon Mill Road, Tifton GA 31794. Did you know zucchini is actually a fruit, even though it’s cooked and eaten as a vegetable? And the name is Italian, because the type we eat today was developed in Italy, even though like all squash its ancestors came from the Americas? 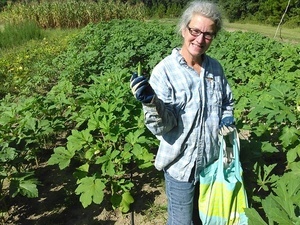 More about Cucurbita pepo, also known as courgette or vegetable marrow, by Master Gardener Laurel Reader, Zucchini: A Treat in the Heat. 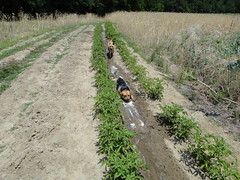 This entry was posted in Okra Paradise Farms, squash and tagged Brown Dog, Georgia, Gretchen Quarterman, John S. Quarterman, Lowndes County, Okra Paradise Farms, potato, rosemary, squash, Tifton, Wiregrass Farmers Market, Yellow Dog, zucchini on May 28, 2016 by John S. Quarterman. Small potatoes to be sorted and taters and grits in the car for Valdosta Farm Days at the historic Lowndes County Courthouse, Valdosta, Georgia, 9AM to 1PM. 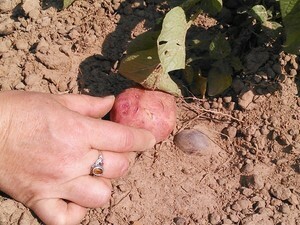 This entry was posted in Corn, Dogs, Okra Paradise Farms and tagged 8 June 2013, Brown Dog, corn, Dogs, Georgia, Gretchen Quarterman, grits, John S. Quarterman, Lowndes County, Okra Paradise Farms, potato, small potatoes, Taters, Yellow Dog on June 8, 2013 by John S. Quarterman. Pictures by John S. Quarterman for Okra Paradise Farms, Lowndes County, Georgia, 30 April 2013. 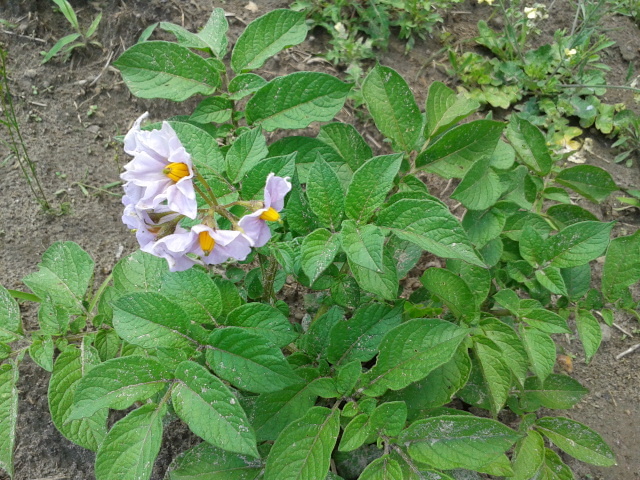 This entry was posted in Potatoes and tagged 30 April 2013, blooming, Brown Dog, Georgia, Gretchen Quarterman, John S. Quarterman, Lowndes County, Okra Paradise Farms, potato, Yellow Dog on May 5, 2013 by John S. Quarterman. 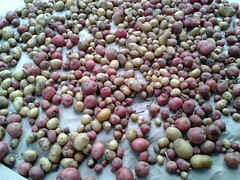 Potatoes red and white, peas, onions, turnips, collards, and radishes! Gretchen Quarterman explains it all for you, assisted by Brown Dog and Yellow Dog. Videos by John. S. Quarterman for Okra Paradise Farms, Lowndes County, Georgia, 27 March 2012. This entry was posted in Agriculture, Gardening, Okra Paradise Farms, Plants and tagged 27 March 2012, Agriculture, Brown Dog, collard, Gardening, Georgia, Gretchen Quarterman, John S. Quarterman, Lowndes County, Okra Paradise Farms, onion, Plants, potato, radish, turnip, weeding, Yellow Dog on March 31, 2012 by John S. Quarterman. 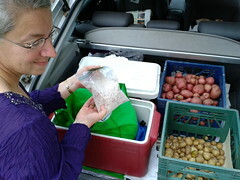 We dug some more white potatoes today. Picture by Gretchen Quarterman, Lowndes County, Georgia, 11 June 2011. 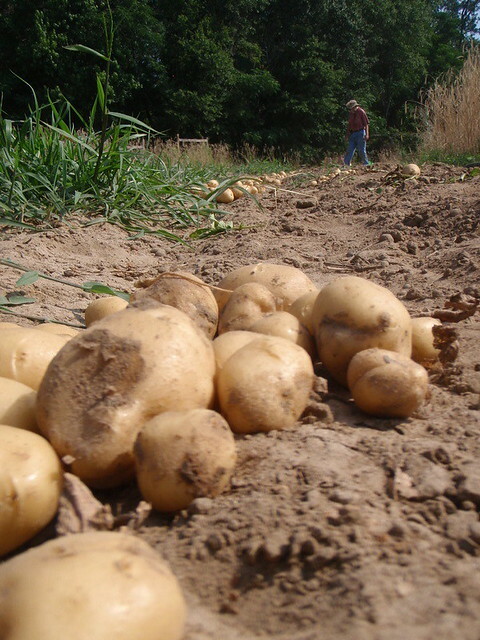 This entry was posted in Gardening, Potatoes and tagged 11 June 2011, Georgia, Gretchen Quarterman, John S. Quarterman, Lowndes County, potato, white potato on June 11, 2011 by John S. Quarterman. Brown dog and yellow dog see mud. They know what to do! Brown dog likes to drink it. This entry was posted in Agriculture, Dogs, Food, Gardening and tagged dog, garden, Georgia, John S. Quarterman, Lowndes County, potato on May 28, 2011 by John S. Quarterman.